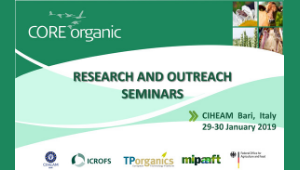 The CORE Organic Cofund Research and Outreach Seminar, which will be held at CIHEAM Bari on 30 January (9 a.m.), is aimed at creating a broader and dynamic transnational research pool to support sustainable growth of organic agriculture and organic food. This seminar, jointly organized by CIHEAM Bari, MiPAAFT (Ministry of Agriculture, Food, Forestry and Tourism), ICROFS (International Centre for Research in Organic Food Systems) and the Federal Office of Agriculture and Food (BLE), is especially intended for partners from Third Countries - mainly non-EU Mediterranean Countries (Algeria, Morocco, Tunisia, Jordan, Lebanon, Egypt) and Brazil. The focus will be on support to research and innovation in the organic and sustainable food sector, increased innovation potential, accessibility to knowledge, research alignment and international awareness raising. The launch of a 'joint programming and co-financing' initiative will be discussed with the above countries and with EU countries, in order to promote Euro-Mediterranean and international cooperation on organic farming. The CORE Organic consortium (Coordination of European Transnational Research in Organic Food and Farming Systems) was formed in 2004 with the goal of promoting research in the field of organic farming. CORE organic Cofund supports transnational research and innovation activities, to address the most important challenges related to the organic value chain and, in particular, to unlock the potential of organic production, improve efficiency in the management of organic resources, and improve animal welfare. More than seventy participants from 25 European and non-European countries are expected to attend the seminar, represented by their ministry officers, members of research councils and centres, and stakeholders. Italy will be represented by MiPAAFT. The ERANET CORE Organic network was established in 2004 and since then 6 transnational calls for proposals have been launched. The seminar will be preceded by a meeting in 29 January, during which the coordinators of 12 projects - already funded by CORE Organic Cofund- will present preliminary results.